The best way to keep your car running smoothly is to come in and see us for regularly scheduled maintenance. 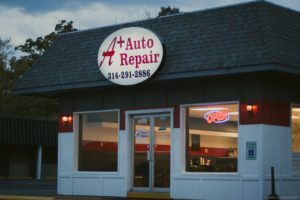 From belts to batteries, brake jobs to tires, exhaust to air conditioning, suspension systems to filters, regular visits to A+ Auto Repair where we are certified and specialize in auto repair will help prevent costly repairs to your car, van, light truck or SUV. Getting on a regular maintenance schedule can also prevent time-consuming multiple visits because many car repairs can be handled in the same visit if detected early enough. For example, while you’re replacing a faulty timing belt it might just be time to replace your water pump that is beginning to leak since the labor done for both procedures is basically the same. There’s no use paying twice, with both money and time, for a job that can be completed expertly in just one visit. There’s no reason to wait for a rattle to start or an annoying knock. Just get on a regular scheduled maintenance program for checkups and it will pay off down the road. If you need assistance with determining a maintenance schedule, please talk to one of our certified technicians. Our specialty is in the area of customer satisfaction. Our regular customers particularly value our integrity and the respect we have for our customers. We know our success greatly depends on customer satisfaction.